Getting to the 100 mile wilderness was very emotional for me. It meant that I had about 115 miles left. I stayed at Shaw’s hostel, which was definitely one of my favorites. Poet, the owner, knew all of the ins and outs. He offered a supply drop for the middle of the wilderness, but I wanted to be a big girl and carry all of my food for the whole stretch. He dropped Durpadur and I off at the trailhead. He gave us both a hug. He told us that we will never be the same people we were when we first started the trail. He also told us that once we got to White Cap Mountain, a plethora of emotions would hit us like a ton of bricks. He told us once we go to that exact spot, to remember who we were when we first started the trail and to think about how much we have changed. It’s called the 100 mile wilderness for a reason. There are no outs. 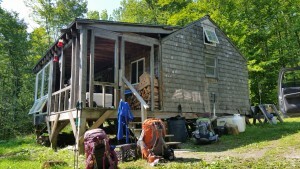 You are secluded away from towns and civilization for exactly 100 miles. This was pretty normal for me in the early days. It was routine to go 4 or 5 days without resupplying in the south. Towns were few and far between. Once I hit Pennsylvania, I got spoiled. my food bag started to get lighter and lighter with every resupply because I was constantly coming across towns. Once I got to New York, I only carried 2 days worth of food at a time. 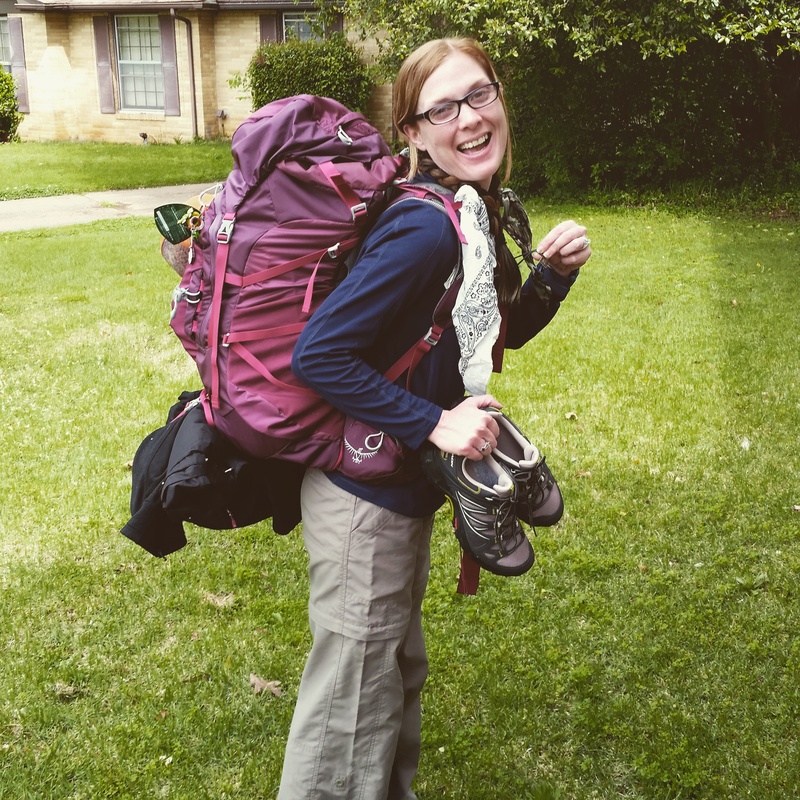 So, I entered the wilderness with 6 days of food…. and a heavier pack than I was used to. Despite being so secluded, the wilderness is amazing. It throws memories of all 14 states at you. It gives you a taste of the entire trail in just 100 miles. The only thing it didn’t offer was rhododendron tunnels. Other than that, everything was covered. Within the first few miles, you get ponds and one of the prettiest waterfalls I have ever seen. 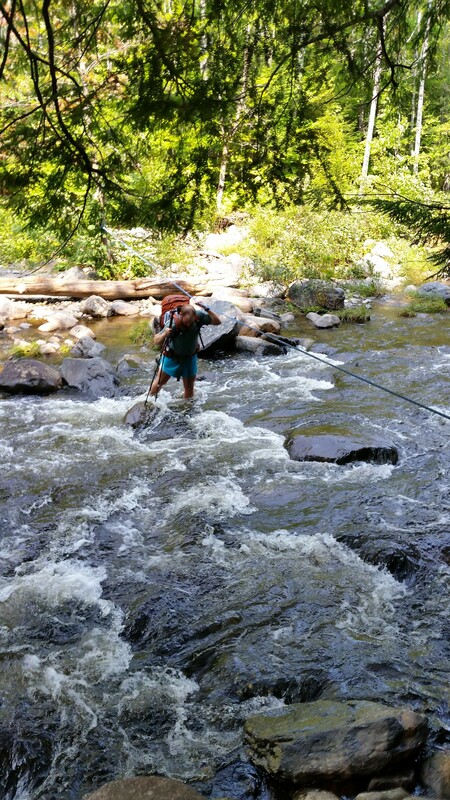 You also get one of my favorite parts… fording rivers! 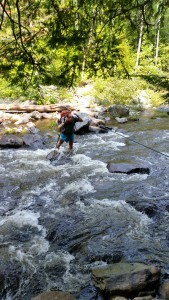 I may be terrified of heights, but crossing rivers gives me a rush that I can’t explain. 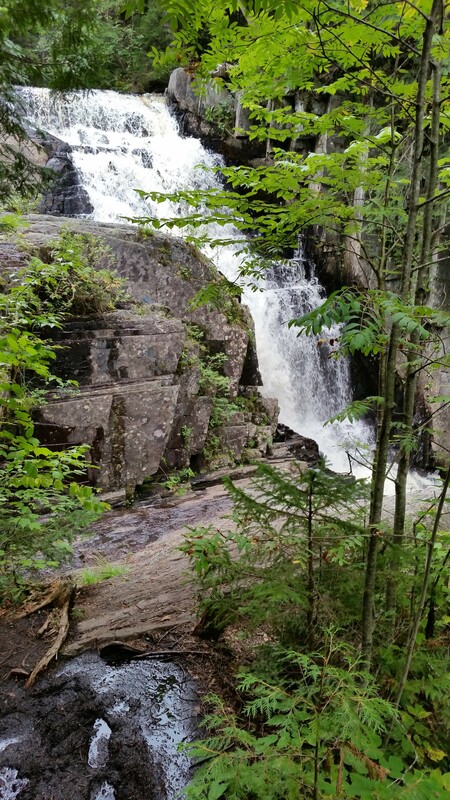 Rivers, overlooks, and waterfalls…. what more could you ask for? 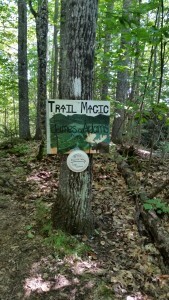 The wilderness also offered some of the most generous trail magic. You can’t miss the sign…. I envy Scout. 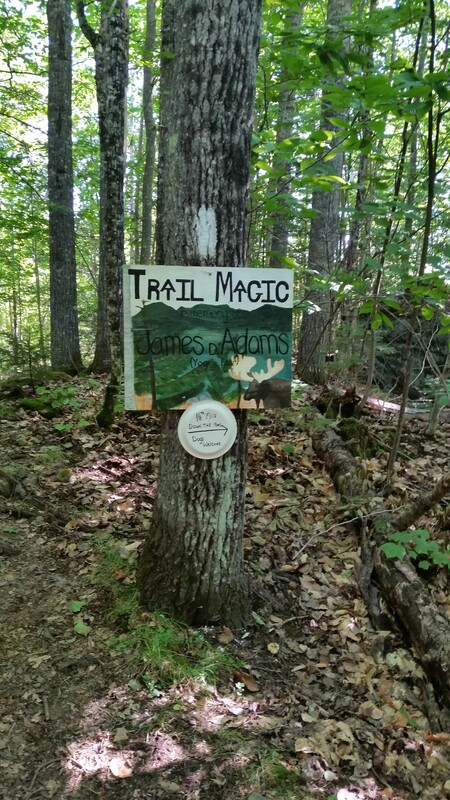 He has devoted his life to honor his son by helping hikers out. He opens his summer home to anyone who needs it and can cook a mean burger and hot dog. I regret not zeroing at his place to get to know him better, but I figured the wilderness was not a place to get behind. Once you leave Scout’s place, you enter the hardest 30 miles of the wilderness. Maybe it’s not necessarily hard, but different. I’ve climbed higher mountains, but it was just very technical. When you are not hopping rocks, you are stomping through muck. When you are not stomping through muck, you are slipping and tripping on roots. It is so beautiful and fun that I could just yoyo it over and over again. It is also very quiet. There was one day that Durpadur and I did not pass or see anyone else…. that was the day we climbed White Cap… that was the day we saw HER for the very first time. That was the day everything Poet explained to us happened. We had the mountain to ourselves. We were once again in awe of Maine’s beauty. She is so magnificent. We spent a fair amount of time on top of White Cap and knew what we were about to see about .9 miles later…. only we saw HER immediately as we started to descend. We questioned ourselves. Were we supposed to see her that soon? 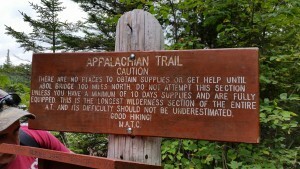 The guide said .9 miles down White Cap, not right away. But it was HER and we both knew it! 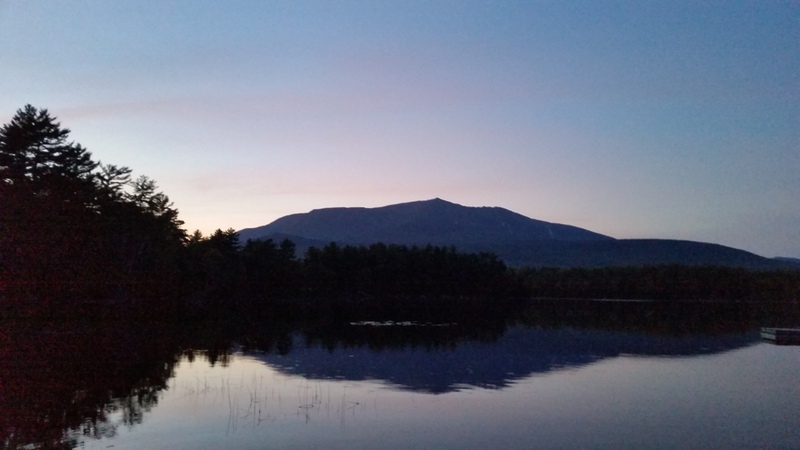 We were finally seeing Katahdin! I played peekaboo with her for a while in disbelief. Unlike Santa Claus or the Easter Bunny, she really does exist! I was speechless. Everything I had worked so hard for up until this point was right in front of me. The rain, the sleet, the steamy heat, the bugs, the ticks, the falls, the injuries, the sweat, the tears, the goodbyes…. it didn’t matter! It was all part of an experience that would finally unite me with this mountain and it was all worth it. 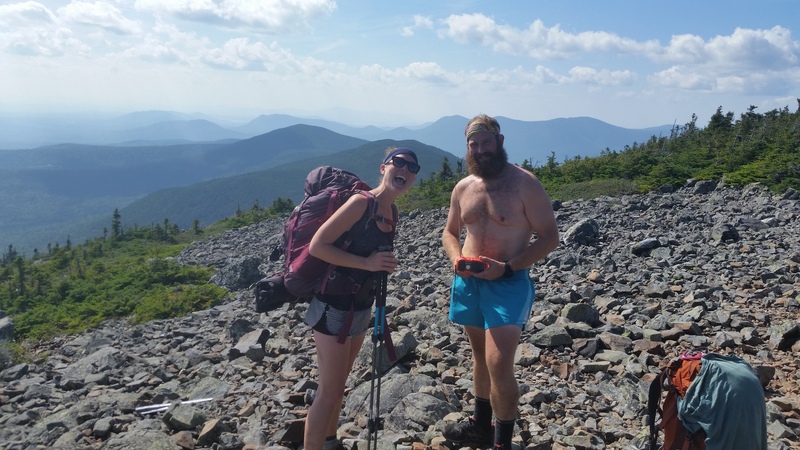 It didn’t matter that Katahdin was still 70 miles away, I felt satisfaction. In a way, I was ready to see her, but at the same time it meant I would have to part ways with this dream that I worked so hard to turn into a reality. I whispered into the wind that I would meet her soon enough and finally walked away. The rest of that day, Durpadur and I talked a lot about things. I’m usually pretty quiet while hiking, but not so much that afternoon. We had been together since day 3 on the trail along with my best friend, Hooter. Once Hooter went home in Harper’s Ferry, it was just the 2 of us 24/7. We had common goals when it came to the trail. We both came to the trail with the same intentions. We hiked the exact same pace and my weaknesses were his strengths and his weaknesses were my strengths. We talked about whether or not we got everything we needed out of our hike. We talked about whether or not we had any regrets. We didn’t have any regrets. 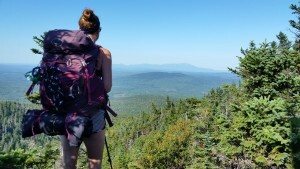 Everything we saw and experienced on the trail rounded us to be the people we would be on the summit of Katahdin… the people we would be when we got home. The people we have turn into. We had a conversation back in Virginia while we were aquablazing. I told him he was probably not the same person at home that he is on the trail, because I had already witnessed changes in him. He said he wanted his trail personality to go back home with him. I told him he couldn’t be this person because it’s not socially acceptable. I was wrong. You can’t be the person you were when you started the trail anymore. You’re not the same. You can’t be the same. What you experience in nearly 2,200 miles engraves itself in you. You learn what selfless acts are. You learn to do without technology. You learn to get back to the basics of living without luxuries. You learn to appreciate the small things. You learn what it is like to be homeless. You learn how to get around without a car. I never knew these things before. I was a spoiled brat before I started my 2,200 mile journey. I can’t ever be that person again. I refuse to be that person again. 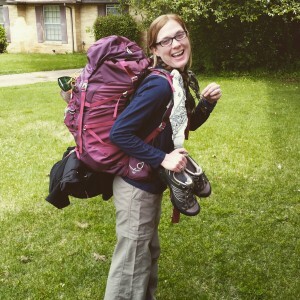 That girl who was leaving for Springer Mountain…. We made it through the wilderness with amazing weather all 5 days. I continued to play peekaboo with Katahdin for the rest of the section. Every step took us closer to her. My heart would pound like crazy. I would try to slow my pace down so I wouldn’t get to her too fast… because that meant it would be over soon. It’s bittersweet. As homesick as you get, you still don’t want it to be over. You then realize that it’s not ending. It will always be with you. This achievement may not mean much to others who know nothing about what you’ve gone through, but it means the world to you and that is all that matters. The next step after the wilderness is none other than Katahdin herself! You have always had a gift for describing the travails of the Trail. But with this entry you have outdone yourself. The degree to which we each allow our lives to be changed by the Trail is variable, but you describe an inevitability to that change so succinctly. Your introspection is touching, thank you for sharing it with us. Thank you. I try to remember the way I felt emotionally during each moment. Sometimes it is hard to express it in words that will make sense. I almost feel like I am there with you……thanks for sharing your adventure.